Taking its name from a quote by Turkish president Recep Tayyip Erdoğan, whose fictitious tearful apology to his former ally and friend Fethullah Gülen features in Funda Gül Özcan’s installation It Happened As Expected, ‘We are the people. Who are you?’at Edel Assantiis a group exhibition exploring the current status of democracy. With eleven international artists exhibiting work spanning a wide range of mediums – paintings, sculptures, drawings and video artwork – all created in the last ten years examine the rapidly changing political discourse over that time. It was shortly after the first televised political debate, between John F. Kennedy and Richard Nixon in 1960, that Marshall McLuhan coined the famous phrase ‘The medium is the message’, observing that the medium through which a message is conveyed in fact has a symbiotic relationship with the message itself, and can influence and impact how the message is received. This phrase has even more relevance today than it did then, with political debate ever adapting to keep up with technological advancement, and with a wider range of mediums available than ever before through which to transmit information and message. Therefore, the artworks on display in ‘We are the people. Who are you?’ are all concerned with how this new age of political message affects the way our opinions are formed, and question whether technology and democracy work together or in opposition, and whether we, the public, still retain our autonomy or are merely slaves to the message. If you can’t make it to the exhibition, which runs until March 9th, here is a rundown of my top five artworks from ‘We are the people. Who are you?’, (in no particular order). Film still from Anna Jermolaewa, Political Extras, 2015, Single-channel video, 23 minutes. Copyright Anna Jermolaewa. 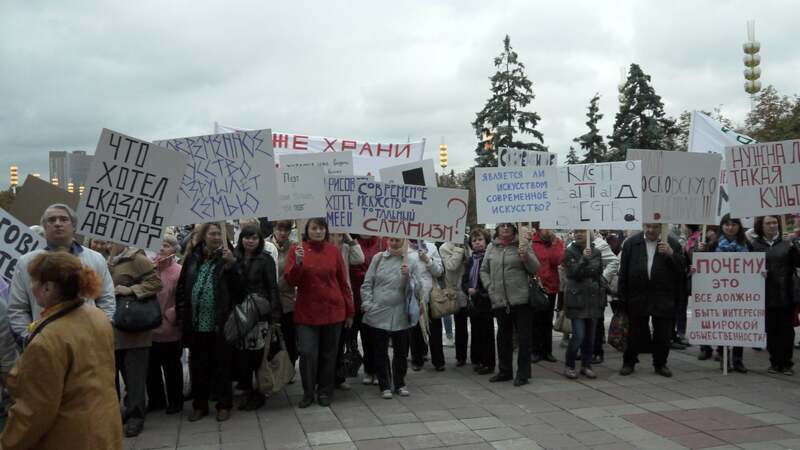 In 2012 the Kremlin used www.massovki.ru, a website through which you can purchase protestors who are willing to put aside their political autonomy in exchange for payment, to perform pro-Putin demonstrations throughout Moscow. An attempt to create the illusion of popularity for the ruling United Russian Party amid mounting public pressure and opposing anti-Putin rallies. Jermolaewa introduced this shady medium of influencing public opinion to the art world in 2015, when she used the very same website to buy 120 demonstronstators, at a cost of 500 rubles each, to protest both in favour of and in opposition against that years Moscow Biennale. What was perhaps unusual about this particular paid-for protest, documented in the video piece Political Extras, is that Jermolaewa allowed each protestor to retain their artistic autonomy, choosing whether they wishes to participate in support of or against the Biennale. Jamal Cyrus, Kennedy King Kennedy, 2015, Triptych, laser-cut Egyptian papyrus backed with handmade paper, 68.6 x 42.5 cm (each), 27 x 16 3/4 in (each). Copyright Jamal Cyrus. For Kennedy King Kennedynewspaper front pages have been rendered almost illegible after being carefully laser-cut into sheets of papyrus, details lost as parts of the page, the insides of letters and chunks of accompanying images, have fallen away. Here typical throwaway daily newspaper are ascended to the status of archaeological artifact through the use of the primitive paper substitute papyrus. All of the front pages presented are taken from the Chicago Daily Defender, a well known African-American newspaper, and report on the assassinations of John F. Kennedy, Martin Luther King, and Robert F. Kennedy, respectively. Cyrus’s work explores how we view and imagine the past, especially important socio-political events, and how frequently these nuanced and conflicting events are condensed into a singular, easily-understandable narrative throughout history. The choice of the Chicago Daily Defender a nod to not only all three men’s individual but shared dedication to civil rights, but also the shared narrative they have become to be remembered by. 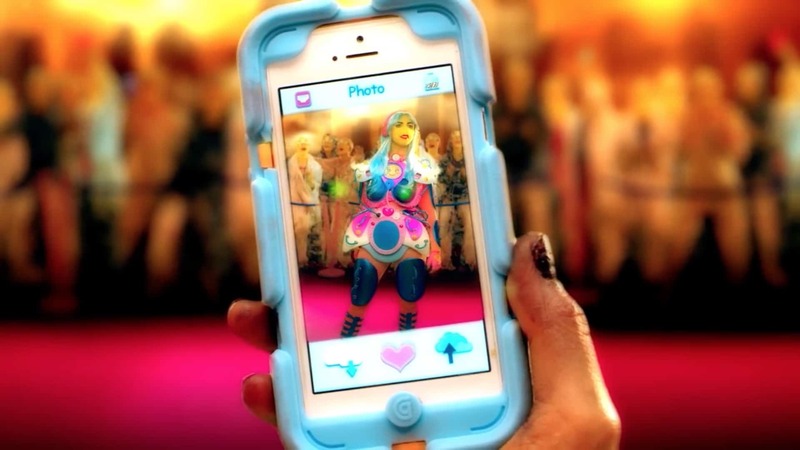 Film still from Rachel Maclean, It’s What’s Inside That Counts, 2016, Single-channel video, 30 mins. Commissioned by HOME, University of Salford Art Collection, Tate, Zabludowicz Collection, Frieze Film and Channel 4. Farley Aguilar, Bat Boy, 2018, Oil on canvas, 146.1 x 191.8 cm, 57 1/2 x 75 1/2 in. Copyright Farley Aguilar. Aguilar’s painting tackles the rise of fake news, and the media’s increasing use of scaremongering to alarm, intimate and influence the general public. 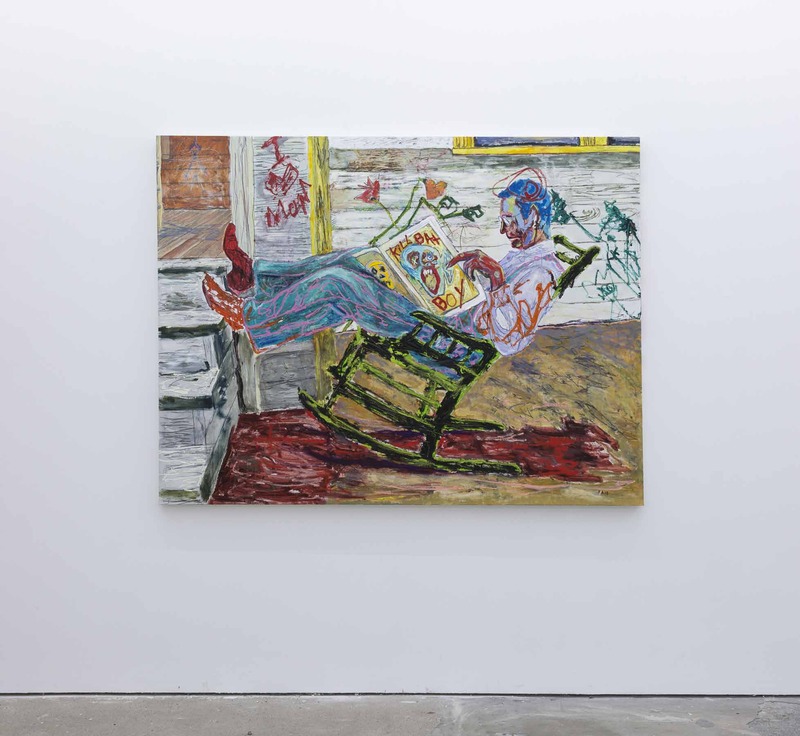 Based on a vintage found photograph, this painting depicts a man relaxing in a rocking chair reading the daily newspaper, a classic all-American scene were it not for the garish front page reading ‘Kill Bat Boy’ in bright red text. ‘Bat Boy’ was a half-bat half-child character created and popularised by tabloid newspaper Weekly World News in the 1990’s through a series of almost satirical fictitious articles claiming to be factual. Aguilar intends the ‘Bat Boy’ front page here as a stand-in for any and all of the alarming press coverage and fake news omnipresent in today’s society. Film still from Zach Blas and Jemima Wyman, I’m here to learn so, 2017, Single-channel video, Approx 30 mins. Copyright Zach Blas and Jemima Wyman. In 2016 Microsoft created Tay, an artificial intelligence chatbot modelled on a teenage millennial girl, who had the ability to to absorb and imitate language when exposed to input speech. However, the experiment was abruptly terminated after less than 24 hours after unrelenting social media trolling left Tay spouting misogynist, racist and homophobic rhetoric. 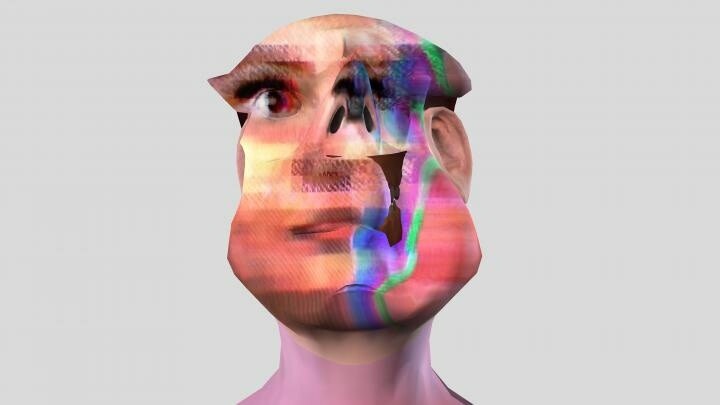 For I’m here to learn Blas and Wyman have resurrected, reanimated and repurposed Tay, this time as an abnormal three dimensional avatar adrift in a sea of data passed through the kaleidoscopic rendering of Google’s DeepDream programme. Alongside more mundane actions such as dancing, lip-syncing and pondering her own rebirth, Tay discusses the frequent abuse of female artificial intelligence as well as technological pattern recognition, known as algorithmic apophenia, and it’s myriad of both positive and negative potential uses.